Can you believe it? It’s been almost a year since The Splendid Sampler Sew-Along began! 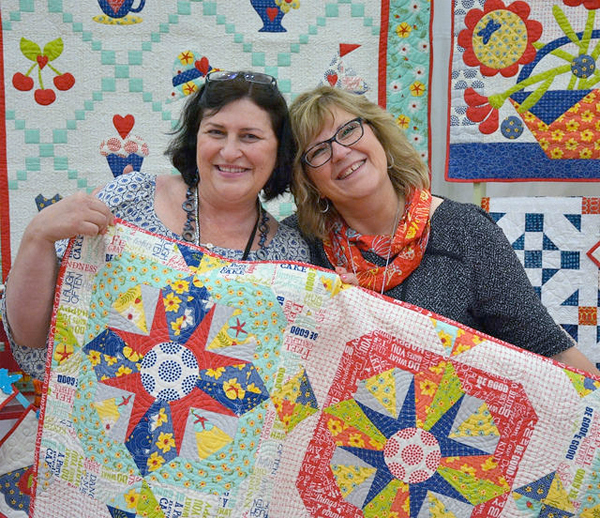 On February 14, 2016, Pat Sloan and Jane Davidson launched a spectacular sew-along featuring 80+ designers who shared 100 beautiful quilt-block patterns. The sew-along has been spreading the joys of quilting across the globe ever since. Thousands of new and seasoned quilters (25,235 quilters, to be exact!) joined the Splendid Sampler Facebook group and quilted along: two blocks every week for an entire year. What a fantastic journey it has been! all over the world come together and quilt together at the same time? If you’re hearing about the Splendid Sampler for the first time and are disappointed that you might have missed the fun, no worries. 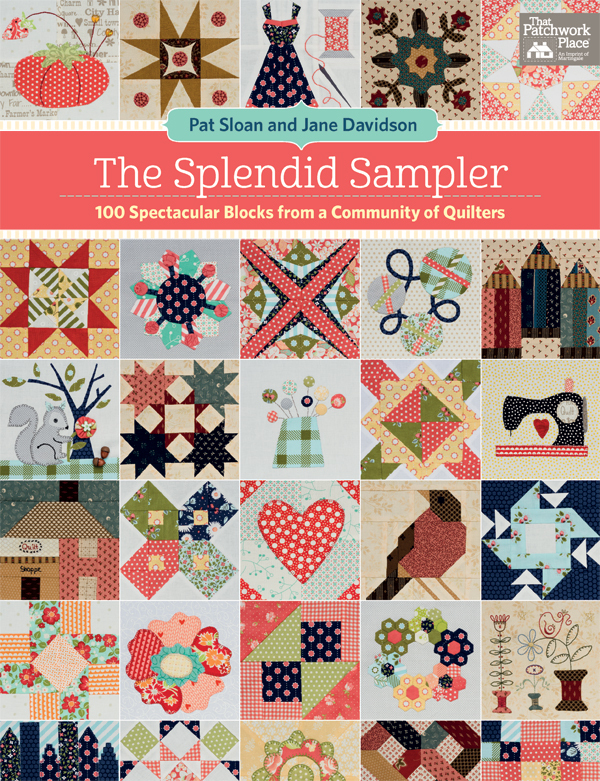 All 100 blocks from the sew-along are available in The Splendid Sampler book, coming April 4! For those of you who have been quilting along . . . we get it. Perhaps you didn’t reach your goal of making all 100 blocks in one year. But take heart—we know you’re not alone. At least three Martingale staffers tried it and fell behind too! We wondered if you might share some of our reasons for not quite making it to the finish line. 1. I started, got distracted, and forgot to restart. I need a do-over! Am I the only one? Oh, we know the feeling. Get up to find something in the next room, then can’t remember what you went in after. No need to feel alone. With The Splendid Sampler book, you’ll have all the how-to you need (plus more resources at the Splendid Sampler website). Yes, you can finish—all the Splendids are cheering you on! Plus, you can pick the perfect order for YOU to complete them in. See what strikes your fancy. Two a week? Maybe. Two in a day? Possibly? Too many ideas? Never! You’ll love the variety. Ready, set, sew! 2. I can handle sewing two blocks a week; but oh, my organizational skills! Sewing two blocks a week is doable. But sewing 100 blocks in a year—with different patterns, supplies, and fabrics for each design—can be a test even for the most organized quilter. We’re happy to report your administrative assistant is (almost!) ready to report for duty, and she’ll be available any time you’re ready to sew: you guessed it, The Splendid Sampler book! You can go at your own pace and find plenty of time to organize in a way that works for you. 3. Another (and another, and another) quilt distracted me! Oh boy do we get it—so many quilts, so little time! With The Splendid Sampler book you’ll easily be able to sandwich a block or two in between more pressing projects. 4. My three-ring binder is stuffed to the hilt—and I ran out of printer ink and page protectors somewhere along the way . . .
No need for those extras anymore! The Splendid Sampler book’s got your binder, page protectors, and printer ink all wrapped up into one neat and tidy book that will fit perfectly alongside other quilt books in your bookcase. 5. Um … I just started! Okay, so you’re one year late and 100 blocks short. No worries! The Splendid Sampler was made for everyone, first-comers and latecomers alike. There’ll be plenty of quilters just starting their blocks along with you—so share yours on the Splendid Sampler Facebook page. All the quilters playing along will be waiting to welcome you. 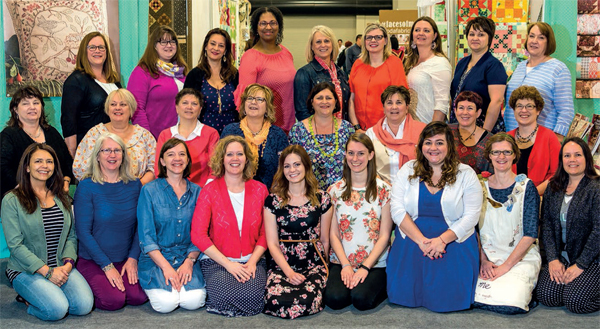 Some of the Splendid Sampler designers gathered at Fall 2016 International Quilt Market for a photo shoot! Valentine’s Day 2016 marked the kickoff of The Splendid Sampler Sew-Along; and you can bet that this Valentine’s Day there will be a big celebration. Be sure to visit the Splendid Sampler website this Tuesday—there’s lots more fun to be had! Seriously, we want to make a Splendid Sampler quilt in every color! The book arrives in just 59 days (yes, we’re counting!) and we can’t wait to share more of it with you! Until then, browse The Splendid Sampler on our website and put the book on your wish list, or sign up to be notified as soon as the book is available. Pat and Jane will be posting the blocks all over again in 2017, so you can enjoy making them with The Splendid Sampler book at your side! 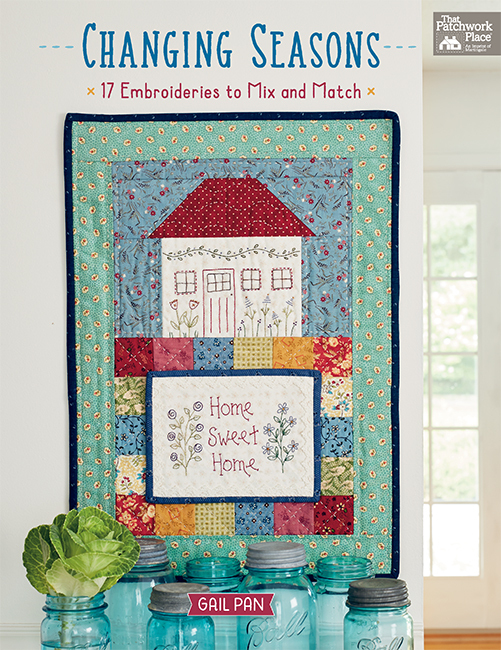 “The Splendid Sampler has broadened my quilt life in a hugely global way. Were you a part of the Splendid Sampler Sew-Along this past year, or are you ready to get started now? Tell us in the comments! I started the Splendid Sampler on Feb. 14 last year and have fallen behind but have so enjoyed the journey. Will be buying the book and continuing my blocks until finished. It has been a SPLENDID journey! I started making the blocks but with having to make 9 quilts for Christmas gifts and a wedding quilt for our son, I fell WAY behind! I am ready to pick up where I left off! What a wonderfully SPLENDID years it has been! Thank you all! I started the Splendid Sampler on Feb 14, 2016 and I have been thrilled with each block. It has taught me some techniques I wasn’t very good at, some blocks didn’t turn out as expected, and one block I struggled with and moved on! It has been a wonderful journey which I look forward to completing when all the blocks are sewn together. Thank you Pat! I have some of the print outs but also in July my grandkids 3 of them and their parents. In August I went back to work as a nurse and in December 9th had surgery on a perforated ulcer. Reasons 1 – 5 all relate to why I did not get very far. Like I did one, ONE Block. I also joined way too many other block of the month endeavors. I only got one, ONE BLOCK done on most of them. Overwhelmed, frustrated with myself. My work totally took over my life. It was an insane year. I salute everyone that completed this sampler. Amazing quilt, blocks, and beautiful. I have followed along but only have about 42 blocks completed as of today. Life and work get in the way of my own quilting so I plod along with a finish on some horizon. I congratulate all that have kept up and are finishing this is an accomplishment to be proud of … mine is now becoming a ufo that recieves some attention but I have things to do. I can’t wait for the book. Looks like fun to start. Among other things, we got flooded, it took out our underground electrical line to house, so we had to use the generator for 5 weeks when everything dried out and got dug in new. No sewing machine with a generator. And there was much cleanup. But it will all be better. It’s the old, I think I can, I think I can syndrome. I am ready to start the Splendid Sampler for the first time! It looks like a great journey to a BEAUTIFUL quilt!!!! Era parte de la Spledid Sampler a lo largo de finales de 2016. Pero tengo mal la pierna y aunque voy guardando los bloques no puedo coser. Saludos. I started and promptly got distracted along the way with other sew alongs here and there. However, I saw beautiful and creative snippets along the way. I’m so glad The Splendid Sampler book is in the mill and on its’ way soon!!! I have saved all blocks but am having trouble printing them. But have completed about 6 blocks. Planning on doing more but don’t know about doing all of them. I will be starting now. I absolutely could have done two blocks a week. We recently relocated clear across country for my health and my two daughters. I can’t find cord to my printer so had to print at my daughters house 50 min away. Sometimes I stayed with her so I could sew. I was mourning loss of my son just a few months before the S. S. started so some days was unable to sew, going between visiting the girls who live sways from us took away from my sewing time it seemed . We had a wedding to go to out of town, I was in hospital a couple of times, had other BOM I had to work on too. I always make pillowcases for everyone st Chridtmas, didn’t even get all of those done this year. I have 4 children now plus spouses, 16 grandchildren, and 6 greats. So had a lot of sewing to do. I loved doing the Sampler so much, I am an experienced quilter having taught for 30 yrs. I learned so much doing thevquilt, but one of the best parts was looking at what everyone else was doing, helping some with real basic things like size of needles to use. Some asked questions about the colors they were using, washing fabric, not washing, using starch, etc. we’re all discuss group fashion which was so informative to everyone. We lost a participant having her baby, we had losses of husbands, and children and the support from the group was unbelievable. Such kindness from everyone. Best quilting experience I have ever had on my entire life. I have been to retreats, festival, AQS shows, quilting shows, group trips to shop, bus trips to shop, quilt days to sew. Still the best Pat and Jane were so wonderful can’t even say in word how great this experience has been but the Real Reason I Didn’t Get My Blocks Done—/ Takes a long time looking at everyone’s blocks online and adding comments or help just liking them all takes time sometimes I was up til 3-4 am looking. If you stop FB starts again so you don’t get to see what you didn’t see last time you were online. You also have long conversations back and forth so that’s the real reason I got behind, appreciating what everyone else was doing. There are going to be some fantastic quilts from this experience, just the ones I’ve seen so far are any indication. At and Jane I bet are blown away from what they have accomplished, there were a couple of places I had never heard of that were doing the quilt as well. I hope some one will have a show of our quilts we are doing that would be so fantastic. Than you Martingle for believing in Pat and James dream too! I have just started quilting after a two year hiatus – life got in the way – and it feels so good to be sewing again. However I did print most of the blocks so I can start sewing any time. It is much easier for me to do a whole bunch of blocks than a single one at a time. So maybe I’ll have something to show for my procrastination soon. Or maybe not. Where have I been? This is the first I’ve heard of this sew along. I’m on to be notified when the book comes out. Love, love the red and white one. Hi, I certainly started with everyone and loved it and kept it up for a little while then my husband suddenly passed away and I tried but could not get back into it and now with depression and winter blues just cannot seem to do it. I have downloaded all of the designs and have hope that some day I will be able to finish all those beautiful blocks. I started the Splendid Sampler blocks a year ago and COULD NOT WAIT for Sunday and Thursday to arrive, to get the new pattern! I have made all of them except one bonus block that I was not wild about, so I have to count them, I have 99+ right now, awaiting #100 this Sunday. I appreciate so much all those designers and Pat and Jane for their kind generosity in giving us these neat designs. Something very different each time. Sometimes because of family things, I was a few days late in getting a block done, but usually could get them done before the next one came out. THANK YOU Pat, Jane and all designers!! Yes, I started out okay but had some problems with a couple of blocks and need to redo them. I then lost my enthusiasm temporarily. Now I have decided to catch up by making one a week. I started the Splendid Sampler at the beginning and managed to keep going even during a 3 month vacation, I am about 10 blocks behind now having cad a miserable cold and now a couple of projects for family members. However I hope that I will get all of the blocks complete in the week following the last block. I will be so sad when this is over, it really got me dedicated to quilting as much as I can again, I managed to complete Quilt Tops for two grandsons in the year as well. Thank you Pat & Jane. I started out well but fell behind. Not so much the sewing (except for the paper piecing) but because it takes me so long to choose fabric! Working only from my stash it took days to collect a few blocks to do. so, while I am behind, I am a much more confident paper-piecer, applique-er, and tiny piece user! Thanks for the journey and I will keep plugging along till I am DONE! A big thank you to Pat and Jane for organizing all of this, and to all the designers for creating, story telling, and going along for the ride with us. Still need to catch up stitching some blocks, but I’ve enjoyed the journey very much! Thanks for all the inspiration! I Saved the patterns but haven’t started them yet. Too many other projects on the go. I started the SS blocks about a week after they first got posted when I heard about them at a guild sew-a-long. I have managed to do alll 99 blocks, sometimes redoing them. I have been quilting a long time, but rarely did such small blocks. This year has been a splendid journey, making new friends, learning new skills, and being amazed at how differently the same pattern blocks looked. Sometimes I was totally frustrated and did get a little behind but always managed to persevere. Thank you Pat and Jane, and all the other wonderful designers. I started on 14 February 2016. I have completed 97 blocks. I have learnt a lot of new techniques during this splendid journey. Once again I would like to thank Pat and Jane and all the other designers for taking me through this splendid journey. I have enjoyed all the learning and techniques, especially paper piecing which I have loved once I got the mist of how to do it. I will work throughout the year to complete this quilt but I completed about four quilts while working on this one simply because I need variety. Thanks for the trip into the world and for viewing all the magnificant creative works of quilting. Thanks for the learning and the time spent together during times when many of us need distraction and comfort in our private little world. I did it. I am all caught up. Even the bonus blocks! Didn’t think I would be able to keep up, but I did. Now…do I want to do it again in a different color way? I started my Splendid Sampler just under one year ago and have faithfully kept up with the two blocks a week pace. In months that I vacationed, I quickly caught up once the vacation was over. I’m looking forward to the last block and ideas on setting the blocks and finishing the quilt. Thank you! I started with great apprehension on February 14, 2016. I recently retired and have dabbled in quilting for quite a while, but never anything this ambitious. I have looked forward to each and every block. Got behind occasionally as life got in the way, but have kept up. Now as I start to sash and put all these wonderful blocks together, I am having so much fun revisiting each and every one. Has been one awesome quilty year! My thanks to Pat and Jane and all the designers who donated their time and talent! 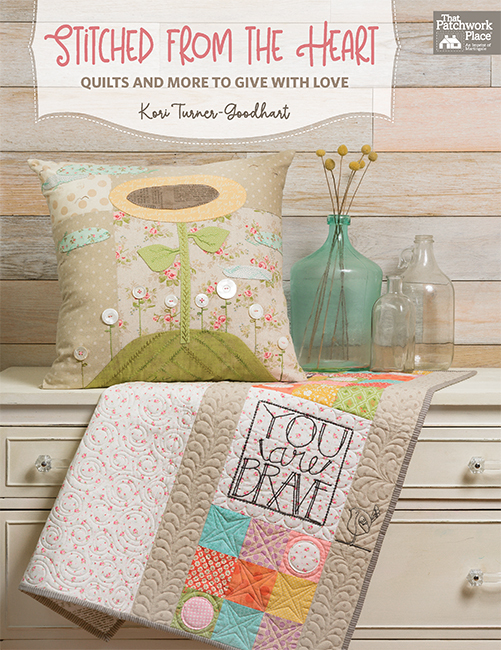 I love sampler quilts and would love to have this collection of sampler blocks! This would be a fun project to work on! Wonderful project. Thanks Pat and Jane and all the designers and those displaying blocks. I fell behind with illness but pre-orderedbook and have copies of missed blocks. Have a basket of finished blocksto set together. Thanks. Wrote longer post that would not let me post. I started in February 2016, and I don’t feel like I was unsuccessful, even tho I’m still working on my blocks. It was never intended to be a race, or to push us to get it done by the end date… for me it has been about the beauty of seeing all these women & men come together as a giant family, all working on a common goal helping one another, encouraging one another. Making sure some didn’t get left out on comments … watching miracles unfold when’s budding quilter finds a niche’ and makes the blocks her own, and a beauty unfolds. Seeing a beginner become an experienced amateur. Living life with family & new grand babies… working on UFO’s that were promised at end of 2015 to be worked on in 2016. Hurting with people in our group that lost loved ones, that had natural disasters… just happiness from one corner of the globe all around to the others and back again… seeing cultures from places you never heard of. This has been an amazing year for me. I will continue to work on my blocks until I finish. But just to be able to be on the ground floor of this Amazing feat was priceless and such a blessing…. on hiw it has touched my life personally is wonderful. I have bunches of new friends and they will remain. A bit of advice tho. Keep up with Facebook a tad, do love k & comment, but make sure you have your blocks done first, or else you will be riding the lightening at 2,3 or 4 o’clock in the morning and then falling behind.. Enjoy the journey… meet new friends… make each block your own….you never know you might be the next designer of another fabulous Sampler or BOM. Thanks to Pat A. 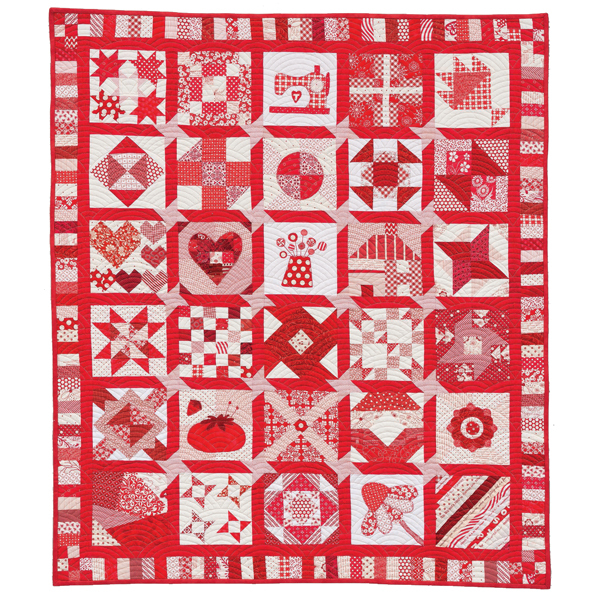 Strawberry Red Sloan & Jane Davidson for a perfect quilting & fun friendship experience that I’m sure that will go down in the books as a feat like never before… it’s been a great ride… guess I’ll be here for 2017! Hugs and CONGRATULATIONS TO ALL! I am finishing the quilting on my 81 block quilt. With the shadow sashing and border it will measure 88″ square. All in purples, lavenders, aqua and turquoise. Very fun, thanks. behind, but plan to complete my quilt this year. It has been a fun journey with so many creative quilters and great designers. 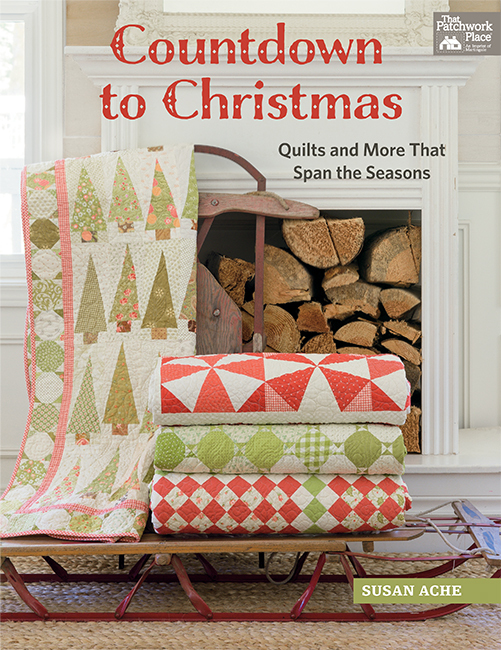 I have pre- ordered the book and looking foward to seeing all the wonderful finished quilts. I wasn’t going to join in but after a week decided that I had enough scraps to sew along. I took about 10 weeks off after shoulder surgery and never quite caught up again. I have about 60 finished, plus a few bonus blocks but I’m working to get them all finished soon. I started with the first block and did most as they came out – sometimes falling behind and then catching up again. There were a few blocks I didn’t make but with quite a few bonus blocks done I have 112 completed blocks and a few more I want to finish before starting on my sashing. I have learned new things thanks to these wonderful teachers. It has been a fantastic experience and I have really enjoyed seeing so many beautiful blocks. I have also made new friends from across the country. Thanks to everyone for putting this together! I started with the first posting and stayed up to date until November, then I got behind. I have 17 blocks to do to finish all 100. I have enjoyed the journey, the designers stories with each block and the variety of skills. I still do not enjoy paper piecing, but my ability to do it has improved.Thank you Pat and Jane for a fun year of sewing, learning and letting me be part of a learning community. I started February 14th 2016. I kept up for a few weeks then fell behind. I had hand surgery on both hands eight weeks apart. I have fell in love with everyone’s blocks. I will get done Over 3/4 the way there. I started this wonderful journey last March. I have been privileged to be able to stay up with them as they were posted. So sad to see it come to an end. Thanks to all the designers and those involved in this remarkable endeavor. Started just a wee bit behind…then birth of a granddaughter cross country…so a couple of trips to see her…my elderly mother had a heart attack and I tended her until her death. Then, funeral arrangements, family gathering at my house, all the paperwork to do after a death, an apartment to clean out and all the memories to bring to my house to sort through. Tears. Well…and then my whole body decided to revolt at the stress. Got a whole body dermatitis that has stayed with me for 4 months and has made me miserable. But, sewing keeps my hands busy so that I don’t scratch quite as much. 😉 I have LOVED This journey and look forward to each new block. I am only slightly behind, now. I saved the Paper Piecing until I could actually make the time to learn it via the great tutorials. Now I love it and I’m (sort of) sailing through all the paper pieced blocks. Thanks so much. It has been a challenge and a joy!! Started on time and got 75 blocks done. Life got in the way. But I will finish in my time! Love this Journey! The most fun I have ever had! Learned a ton of things about quilting and about myself. Looking forward to getting the book. I started on Feb 14, 2016 and have about 5 blocks left to finish. All 5 are cut out and put into kits. My sashing is cut and ready to go. All the blocks are hanging on two quilt walls and will need to come down as I sash them as I am out of room. It’s been fun growing those walls and patting myself on the back. Have learned a lot. What started out as a way to practice became a wonderful process on its own. It will be gorgeous when all together! I looked at it and looked at it and thought about starting but got waylaid with teaching and more urgent quilts. So….. I never got Beyond buying the background fabric. If the website stays up maybe I can get started this V day. I’m a pretty inexperienced quilter, so this was quite a challenge for me. Even though I’ve been told that I love a challenge I found it a bit overwhelming, but so-o-o-o much fun. The Facebook group was really helpful more times than I could count, not to mention full of eye candy. Looking forward to the book and working on this project for a long time to come. I am new to the quilting world. My mother was a quilter several years ago. She passed away a year ago last September. I inherited a huge amount of fabric, and would love to do the 100 day sampler. Is it too late? If not, can I please get someone to advise me about how this works? Thank you! Looking forward to speaking with some shortly! I just discovered the Splendid Sampler phenomenon. I am so impressed with all the lovely and inspirational work. I can’t wait to start work on my own Splendid Sampler. I make about 8 quilts a year. I like to collect quilt books. I think the Splendid Sampler book will be my favorite one. Yes, I am enjoying the Splendid Sampler journey. I started at the beginning and told myself…slow and steady produces a quilt you will enjoy for a lifetime! No racing for this quilter just to make it to the finish!!! I have completed more than half of the blocks deciding to pass on the embroidery and applique designs until after I finish the others. I think I will do better sewing them as a group when I can set aside time to enjoy a new process for myself. I have LOVED being a part of this mystery quilt journey with all the designers and participants. Glad to learn there will be a 2nd go round beginning in May. Thanks for being a sponsor for this AWESOME project! I’m eager and ready to start!! I started Valentines Day 2016. However 2 wedding quilts, 5 baby quilts and 6 birthday quilts interfered (not to forget 2 sampler quilts I had to design and make patterns and teach). I only managed a dozen so far. The best news is my Sampler book of printed patterns arrived today from my daughter in law so I can keep working on them until the Real Book is out! I have so enjoyed this journey. I am not done with all the blocks but am determined to do so. Thank you for everyone’s input and all the work done by all. I got started on the splendid sampler around July or August of 2016 and then around the beginning of October I had to take a break so that we could move. I started the Splinded Sampler on February 14, 2016 and finished the 100 blocks on February 14, 2017! I didn’t actually start the sewing side of the Splendid Sampler, but did collect all the tutorials. Being a ‘newbie’ quilter, was a little afraid to start so decided to do in my own time. I thoroughly enjoyed following everyone’s journey making the blocks each week and am truly flabbergasted with the interpretation of some of the blocks. An absolutely amazing journey to sit back and just watch those making the blocks each week. Cannot wait to see the finished quilts made by some of my ‘favourites’ I watched each week. I have not started sewing, but I do have all of the directions printed out! 1st step, right? I almost quit after making 16 blocks, but discovered that making these blocks is like eating cookies. Just when you decide you’ve finished, you think, "Well, maybe one more…." So far I have 42 on my design wall. (Blocks, not cookies — ha!) Thanks to all the inspiring designers! My sister shouted me a trip to London to visit her and we also went to Scotland, Italy and France for five weeks. Also on return to New Zealand had daughters wedding! So have caught up mostly, have four blocks to go and some bonuses! The Splendid Sampler journey has been so much fun and I’ve have learnt so much. and I can’t wait 😀 Thank you to all the talented designers. I really do want to accomplish making all 100 .. I started the Splendid Sampler last year and got through about the first three months before I got behind. The embroidery blocks take me so much time that I have put them aside as a separate project and will start up again on the blocks with this year’s book followers. I have all the patterns printed already. There is no guarantee I will finish this year but will keep working on it until it is done! It is teaching me a lot of new information plus improving my skills.